Qualified, concerned with self-development, and committed to the ideals of the Company – this is the profile of the Team Member that Braskem welcomes in its staff and in whom it invests to contribute so that they may contribute with their talent and have a promising career. For the Company, teamwork, creativity, spirit of service, responsibility and commitment to sustainability are fundamental pillars. 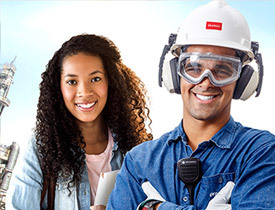 Learn more about the careers in Braskem and entry opportunities in the Company. If you identify with Braskem's principles and values, join our team. We invest in human capital. Learn more about how to join our team. Developing young professionals is a priority for Braskem. The initial focus of Braskem's Diversity Program is to strengthen diversity in the workplace.